White heads of flowers dot the unmowed ball field like cotton balls scattered freely. 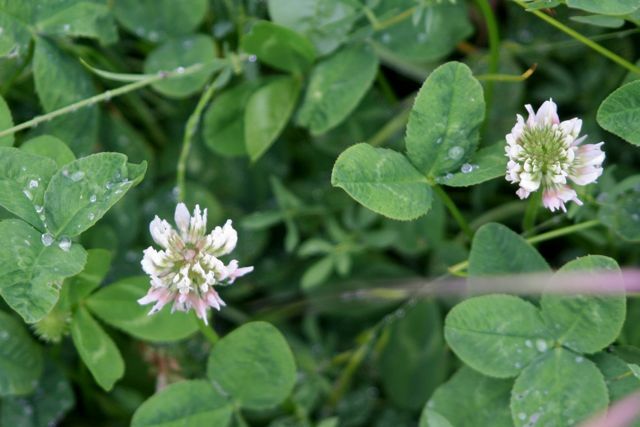 But look close and the blooms are not at all cottony; this is a clover, each head a cluster of dozens of small pea-type flowers. The leaves are distinctively bisected with a faint crescent line that looks like a watermark, or the pattern left behind on paper that was soaked and then dried. 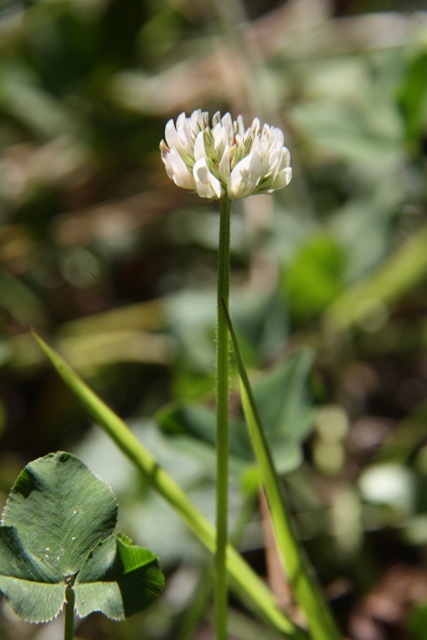 Everpresent in lawns and weedy berms, white (Trifolium repens) clover is one of the most common (and dare I say overlooked) plants around. Rare, shy, or temperamental flowers are a treat to find and behold–but I also like to take the time to get to know the species that are so common that they are easy to ignore. This little European invader is certainly one of those. But it turns out that not only is it a favorite snack for livestock, but humans can eat it too! Young leaves can be used in salads or soups, or it can be cooked like spinach. Dried flowers and seed pods have been ground into a high-protein flour that can be used on its own or as a garnish. The plant can be boiled for a tea, either just because its tasty or as a traditional Cherokee treatment for fever. Roots can be cooked and eaten, and evidently the leaves give baked goods a vanilla-like flavor. Who knew.